Female gowns worn at court during the Regency era looked ungainly. 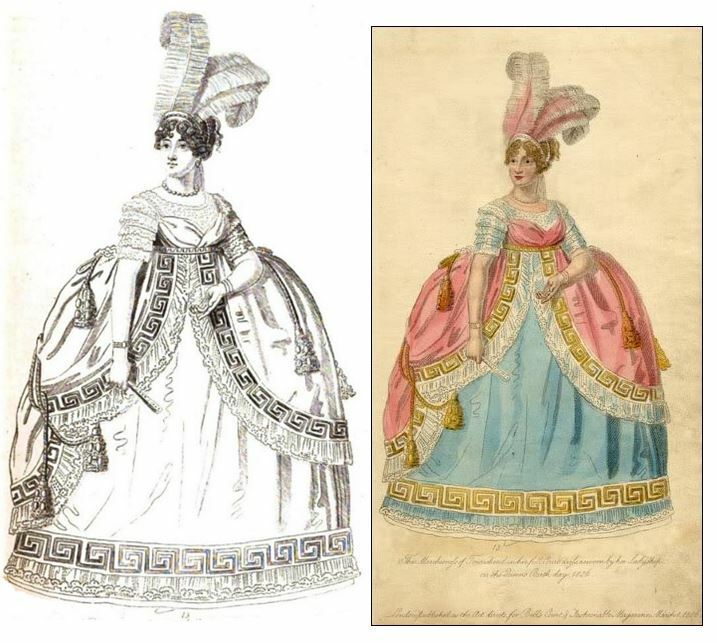 Instead of the lovely columnar silhouette of the Grecian-inspired draped gown, court gowns at this time made their wearers resemble the upper half of an extravagantly decorated apple or a pregnant cake topper. These custom creations, made with sumptuously expensive materials, adhered to the rules laid down by Queen Charlotte, who presided over the royal drawing rooms until her death.Earlier Georgian gowns flattered a lady’s waist, with corsets that made the waist seem miniscule. As waists rose, the silhouette of the gowns became grotesque, swallowing a lady’s figure in a ball of fabric. 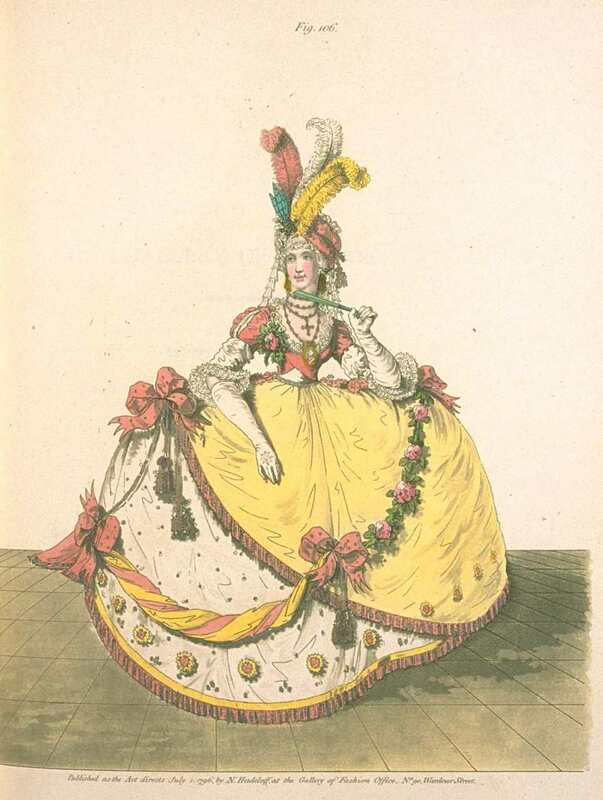 A lady in court dress, 1805. Pub. by Tabart & Co. June, 1805, Bond Str. Young ladies presented at court for the first time wore white gowns. Married ladies could wear a variety of colors.The gowns’ narrow trains looked out of proportion to the wide-hooped skirts. Head-dresses consisted of a diamond encrusted bandeau and from three to five to seven to more feathers. A variety of feathers were used for head ornamentation – heron, ostrich (the favorite), Bird of Paradise, pheasant, and macaw. Court gown, 1806, Marchioness of Townshend. Only the wealthy could purchase fashion magazines with colored plates. Most were published in black and white. Occasions for a woman’s appearances at court included the presentation of the daughters of peers and rich merchants who wished to make their debut in Society, after a woman was married, and after an honor had been conferred on her husband, such as a diplomatic mission or a new title. Rowlandson, Drawing Room at St. James’s Palace in London, Microcosm of London, 1810. Image, Wikimedia Commons. Court etiquette was strict; young ladies took lessons on how to walk when approaching the queen, proper curtsies, entering the room, and leaving the room. Court gowns cost the earth, but every young lady worth her salt had to presented to the queen before she could officially enter the Marriage Mart and engage in the rounds of social activities that the London Season offered. Parisian court gown with high-standing Medici collar and train, 1807 (l). British court gown, with garlands of roses and 5-ostrich feather headdress, 1817-1818 (r). 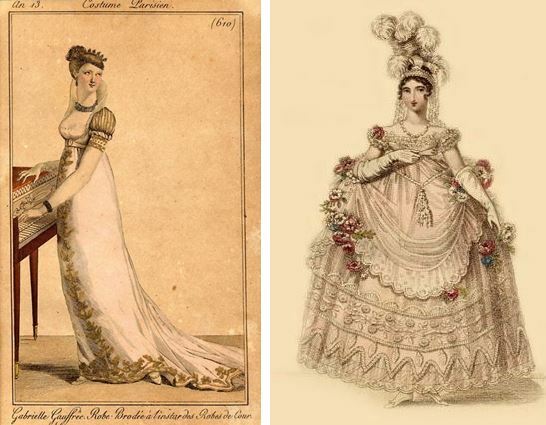 By 1807, Parisians had sensibly adopted court gowns that resembled contemporary fashion silhouettes, while the British still clung to the more traditional, old-fashioned hooped skirts. 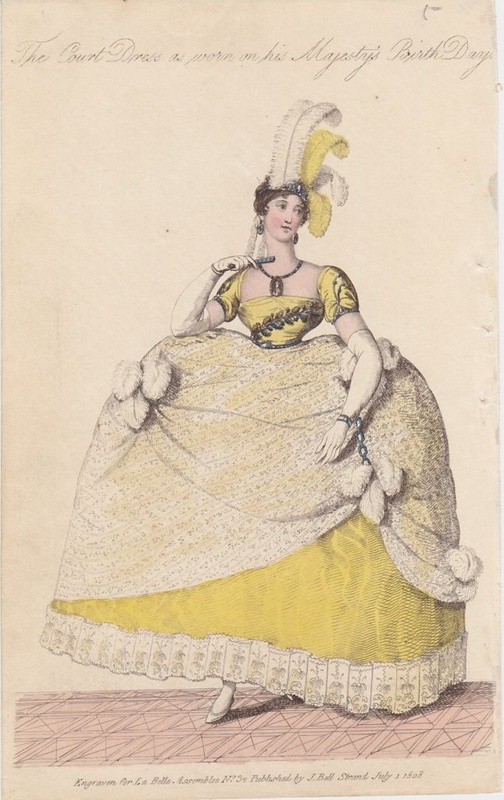 1808 La Belle Assemblee court dress. Waists had lowered somewhat, and the gowns did not look quite as ridiculous, but waists would soon rise again, stopping to just below the breasts. I imagine the assembled ladies at court looked like a flotilla of colorful balloons. Dressing for court was an enormously expensive investment. Careful attention was paid to displaying embroidery and embellishment in the most elaborate patterns. In a united show of thriftiness, Queen Charlotte and the young princesses frequently embroidered their own gowns. Designs were representations of natural objects, such as acorns, shells, wreaths of silver leaves and cloth roses, and peacock feathers. Gowns were made with silver tissue, net, satin, and chenille. Queen Charlotte presided over the royal drawing rooms until she died in 1818. Her daughters took on her duties at court in her place, but the standards for wearing round hoops continued at this time. When the Prince Regent ascended the throne in 1820 as King George IV, the rules for hoops were finally abandoned. Head-dresses. which were generally made of diamond bandeaux and white ostrich feathers, remained. One source said that Queen Charlotte insisted on every one wearing feathers to court, just when they were no longer fashionable. By the regency, most girls came out in society without making a curtsy. The once regular drawing rooms were irregular and some years there weren’t any at all. . The dresses were ugly as well as expensive and must have been a large part of a lady’s wardrobe if she attended court on a regular basis.. Besides the drawing rooms– which weren’t held often between 1811 and 1818– there were the yearly Queen’s birthday celebrations as well as the King’s birthday and sundry other occasions. Some of the ladies would have curt appointments as well. One thing I have never seen addressed and that is whether or not the women of the bedchamber, for instance, had to wear those ridiculous gowns during the time they had to work or if they could wear ordinary clothes. I know Fanny Burney mentioned several things about being at court such as never being able to sit, sneeze, cough, or even move in the Queen’s presence– and having to back away from her, but I can’t remember what she said about the clothes she wore. All those presented to the queen and those around her had to back away from her which made dealing with the train difficult. Fanny Burney said she learned how to kick it out of the way as she took each step backwards. I would have fallen on my face. I imagine those rpesented to the Queen had to practice moving around win those hoops and kicking the train out of the way. Excellent comments, Nancy. I recall reading about that perverse rule regarding the feathers too. They were at their tallest at the end of the 18th and beginning of the 19th centuries. The feathers shortened over the course of the 19th century. As for backing away in the presence of the Queen, I believe the young girls received training in how to do this gracefully. I can’t imagine anything more stultifying than these royal affairs. Thanks for stopping by. Thanks Vic and nmayer for all this interesting information. Very pretty but the practical part of me wonders how they ever got through a doorway. Or managed to sit down when they got tired. Preceding the Regency period, court dresses were made with ultra wide panniers. Ladies were taught to not only back away from the queen, but to move through the door sideways. The round hoops had some give. Still, imagine these ladies getting in and out of carriages, going up steps, and through narrow doorways. Caricatures of the day make fun of the situation. 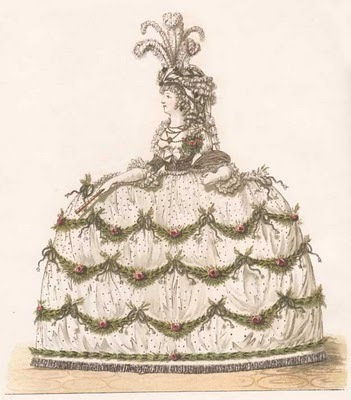 The amount of material required for one of these ghastly “balloons” at least meant that after presentation a young lady would have plenty of fabric from which her modiste could sew a more fashionable gown for Almacks. 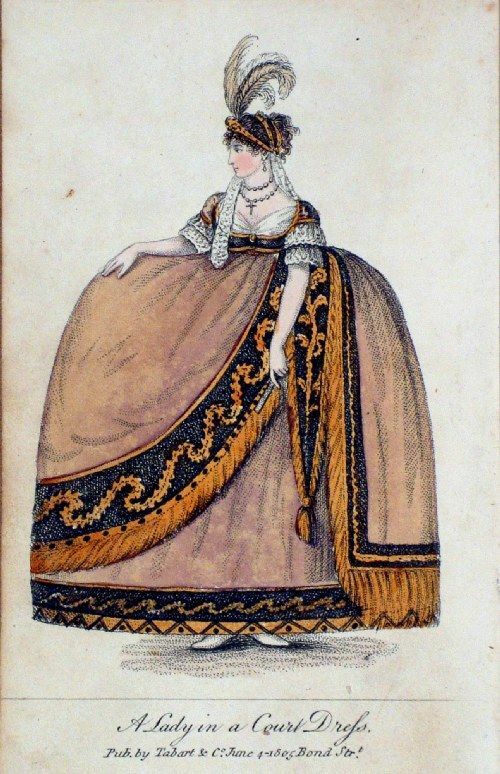 I really had no idea that court dresses were of a fashion other than what was popular at the time. They’re certainly more extreme than I would have believed! Thank you for another of your always interesting posts, Vic! Thanks for this interesting post. It seems the men in the picture are wearing wigs? So I suppose their dress harked back to an earlier era too (not as uncomfortable a style, though!). Just as barristers continued to wear wigs and continue to wear them to this day! Men followed strict rules as to court dress as well. One can just imagine that on a hot day, with all those candelabras burning hundreds of candles, how hot everyone must have been in those petticoats, hoops, embellished gowns and suits that featured shirts, embroidered waistcoats, coats, and wigs. Uggh. These dresses fascinate me, mostly because they’re so ridiculous! Still, I get excited whenever one of my favorite print dealers has a new court dress print. I am compelled to buy them just because they’re odd. And pretty rare, as prints go. And doesn’t Queen Charlotte sound like a piece of work? I have read that she made her daughters’ lives miserable. Hi Vic. You could hide …..well.. almost anything underneath those hooped skirts. I wonder if anybody used those voluminous dresses to be subversive?? There must have been a few rebellious prankster courtiers who thought the whole thing stupid!! !